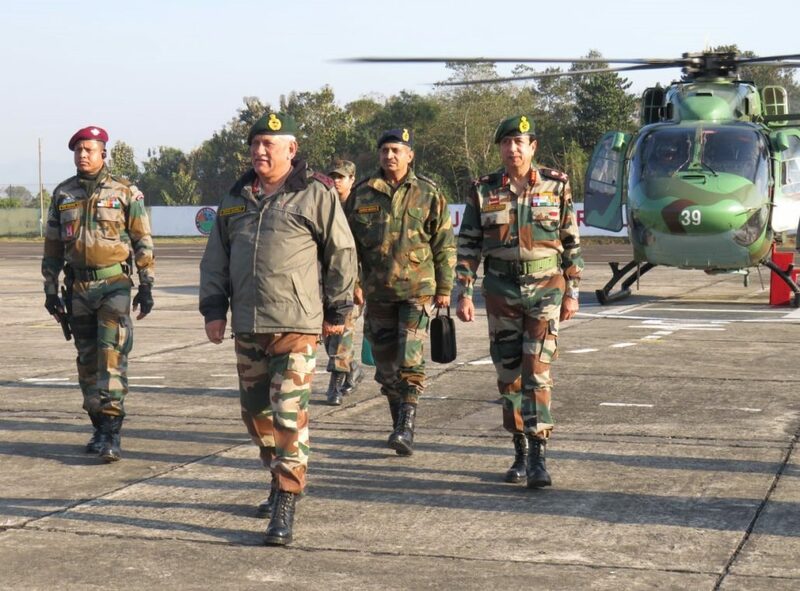 Army chief, General Bipin Rawat arrives in Rangapahar military station on February 2, 2019. Chief of Army Staff General Bipin Rawat arrived in Rangapahar Military Station here on Saturday on a two-day visit to review operational preparedness of army formations in the Northeast region. Gen. Rawat was received by GOC-in-C, Eastern Command, Lt. Gen. M.M. Naravane and briefed by GOC, Spear Corps, Lt Gen Rajeev Sirohi on his arrival, a defence release said. The Army chief expressed satisfaction with the operational preparedness along the Line of Actual Control (LAC) and appreciated the conduct of people-friendly counter-insurgency operations by the Spear Corps. He complimented the troops for ensuring peace and tranquility in the region. The General also interacted with the officers and troops of Spear Corps and asked them to work tirelessly and in a professional manner to accomplish their task. The Army chief is also scheduled to visit Kohima and Itanagar.